Have you ever found yourself drawn to look across the street at a shop window without knowing why? It's very possible you looked at the shop window because you first looked at someone in front of you who was looking in the direction of the shop window. Without thinking about it, your gaze followed this person's gaze shortly after you glanced at his face. It happens in the blink of an eye and without our conscious participation, and it happens every day to nearly everyone. It's called the Human Gaze Principle, and it's an important concept that effective web designers use to draw attention to key elements on their web pages that they wish to emphasize. Good web designers know that site visitors are instantly drawn to images of human faces. If a human face is in one of your web page's designs, your visitors will likely look at it before they look at most of the other images and copy on that page. Even babies and young children presented with various images look first at images of people—and especially at faces. Why? We do it because we're human. And this means we're constantly, subconsciously seeking nonverbal clues about what we should do by looking into the eyes of others—even when "others" are nothing more than two-dimensional stock photos! Once we catch sight of a human face (whether on the web or in print), our gaze does 1 of 2 things. If the face is looking back at us, our gaze lingers. We're talking milliseconds, but it does linger. We then begin looking elsewhere in the design, based on how the design and its content have been laid out. If the face is not looking back at us but is instead gazing off in another direction, we immediately follow the face's gaze, seeking out the object of its attention. Our eyes then linger upon the spot where the face was looking. We look where the face looks because we're wired to do exactly that. Attention Heat Maps offer web designers clues and proof as to how the Human Gaze Principles may be used to boost website response rates. 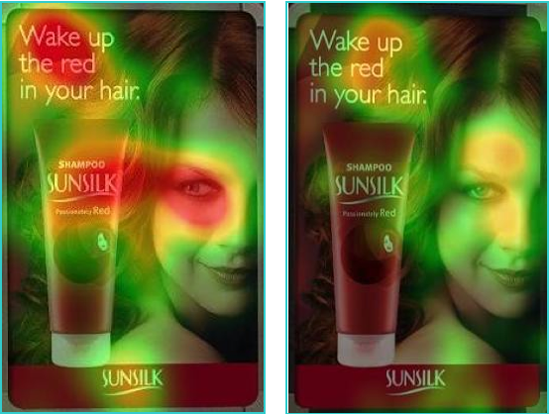 Using advanced eye-tracking technology, Attention Heat Maps superimpose colors on top of a web page, indicating where people look the longest. Time and time again, heat maps have indicated that people look first at photos of people on web pages – then look where those people are looking. Here's an example of an Attention Heat Map. Notice the area of red (heaviest attention) showing how viewers looked at the product when the model's eye looked at the product—and how viewers didn't look at the product when the model was looking directly back at the viewers. 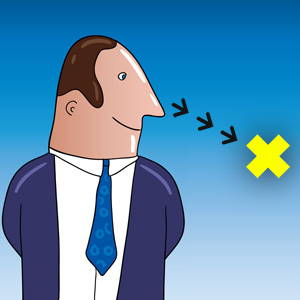 How can you use the Human Gaze Principle to your advantage on your company website? using an image of a person as a focal point on some of your pages instead of images of inanimate objects. choosing images in which people are gazing directly at the critical information, image, or call to action you want to make sure your visitors don't miss. reviewing website usability studies and heat map studies that demonstrate the effectiveness of the Human Gaze principle. By positioning images of people in such a way that their gaze creates a path leading to the most important parts of your pages, you can effectively direct your site visitors' attention exactly where you want it to go. This increases the chances that viewer will take action, click a link, buy a product, or complete the sale. Very cool. Never underestimate the allure of a glance or the power of the gaze. The Human Gaze Principle allows you to guide your website's visitors to the most important areas of your web pages. Position images of human faces looking at the key parts of your webpages. Your visitors will first look at these faces, then follow the direction in which the faces are gazing.